On April 12, 2016, we submitted a Public Records Act Request to California State Parks for all collisions from 2014 to Present. It took 18 months, a letter from King & Spalding LLP and a possible lawsuit to finally obtain 49 Traffic Collision Reports (2014 to 10/23/17) We will publish the analysis of these 49 TCRs soon. Public Records Act Request (April 2, 2015): One hundred and twelve MDSP Traffic Collision Reports (CHP 555) for North Gate Road, South Gate Road and Summit Road were completed and filed by MDSP Rangers. Traffic Collision Reports filed by CHP (the most serious collisions) and park ranger-investigated Trail Public Safety Reports involving Mountain Bike collisions occurring on unpaved roads were not included in this report. 112 collisions over a five years equals an average of approximately 1 collision every 2 weeks. According to Park Leadership, “if the number of non-reported paved-road collisions involving bicycles vs vehicles and solo bikes were included in this report, the overall totals would be significantly higher." 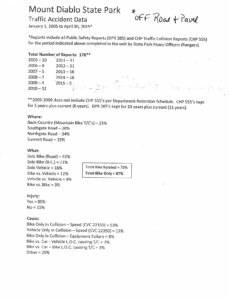 The document below, is the only analysis of Traffic Collisions on Mount Diablo from 2005 to the present conducted by Park Leadership from 2005 to April 2015.